MTTTY (Multi-Threaded TTY) is an easy to use Windows serial communications program. Multi-Threaded TTY (MTTTY) is an easy to use serial terminal utility that you can use to communicate with the RS-232 serial ports on your device or development kit. It is multi-threaded in that you can run multiple instances of MTTTY for each serial port. Displaying status messages sent from a device, such as when using iprintf(). Reprogramming a new application image through the boot monitor. As a serial interface to any application. Port: The PC’s serial port you wish to use. Baud Rate: The host computer and the attached serial device must agree on a speed or baud rate to use for the serial connection (the recommended setting for both is 115200). Parity: Checks whether data has been lost or written over when transmitted between your host PC and your device (default = None). Data Bits: The number of bits in a transmitted data package (default = 8). Stop Bits: The stop bit follows the data and parity bits in serial communication. It indicates the end of transmission (default = 1). Connect: Pressing the Connect button will acquire the PC serial port for the MTTTY application. No data can be sent or received unless the connection button has been selected. 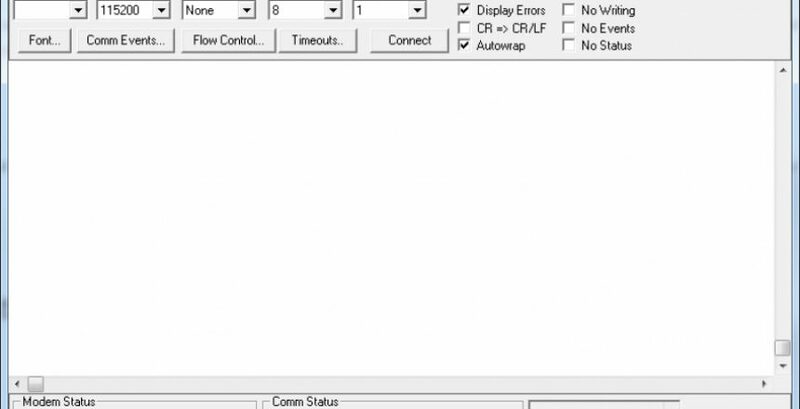 Software flow control is required for downloading an application image to any device without SDRAM, such as the Mod5213 Embedded Core Module or SBL2e Serial to Ethernet device. You can download the latest version of MTTTY terminal application here.